If winter storms left some big stumps on your property don’t worry, StumpTech is here to take care of the problem. 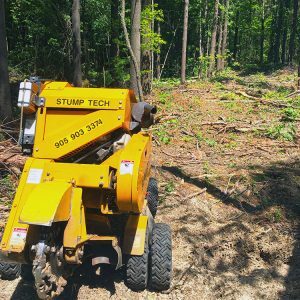 We have more than five years of experience removing stumps, and more than eight years of experience in the tree industry. Our technicians are all well trained and have the experience necessary to remove even the biggest stumps from your property quickly and easily. Our staff members can remove stumps from any type of yard, even fenced yards. We use a wide variety of top grade stump removal equipment that is designed to fit into any space. All our techs need is a gate or an opening that is 36” wide in order to get the stump grinder into the yard. We give our techs the best equipment that is available to make sure they can get those stumps removed fast. It doesn’t matter if you need one stump removed or twenty our technicians can get any size job done. Using the best equipment and their years of experience they can tackle any size yard from small residential yards to sweeping country properties and take those stumps out. Making customers happy is our top priority. We have years of experience removing stumps. We are fully insured against liability and damage so you don’t have to worry. 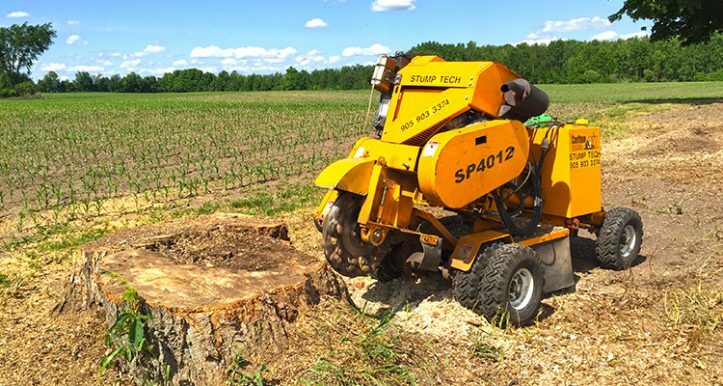 We have the best equipment out there to remove stumps safely and quickly. Our techs will also ask you what you’re going to do with the land once it’s clear. That’s because the cost of the job will be affected by whether you’re laying new sod, planting flowers, or laying concrete over the area. There is a minimum charge of $150 (+HST) for any work that is done. But estimates are free. This minimum isn’t per stump, so many homeowners end up paying just the minimum fee for simple stump removal. 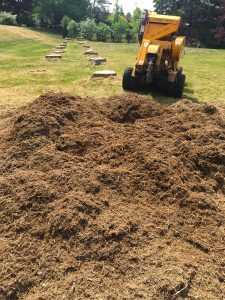 Why Hire A Professional Oshawa Stump Removal Company? Many homeowners think that they don’t need to hire a stump removal company and think about removing stumps by themselves. This is a bad and sometimes dangerous idea. Removing stumps looks easy when it’s done by professionals, but it can be quite dangerous if you don’t have the proper equipment, training, and experience to remove stumps. Our technicians are given the most up to date training on stump removal methods and they have years of experience. They also have the best equipment that is available to make the job easier. In order to get stumps removed safely and quickly, it’s always best to call a professional stump removal company and let the professionals handle it. Otherwise, you could end up wasting a lot of time or even getting yourself hurt trying to remove stumps on your own. Stump removal is affordable for all homeowners so this is one job that is best left to the professionals.